We have teamed up to raise funds for the annual York Days Fireworks! 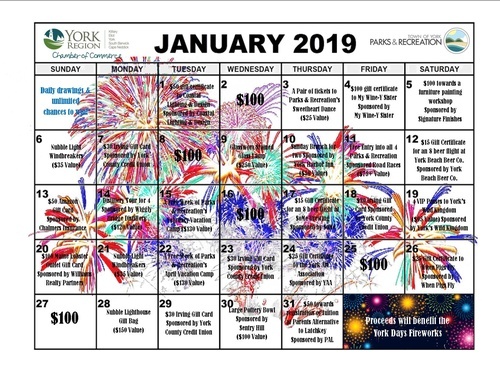 Buy a calendar to support the fireworks and maybe win a prize. Calendars will be sold through December 31 (they make great stocking stuffers, Secret Santa gifts and Yankee Swap gifts) and prizes will be drawn daily in January 2019. You can win a variety of prizes including cash! Total value of prizes over $2,300! !